“I marvel that you are turning away so soon from Him who called you in the grace of Christ, to a different gospel, which is not another; but there are some who trouble you and want to pervert the gospel of Christ. But even if we, or an angel from heaven, preach any other gospel to you than what we have preached to you, let him be accursed. As we have said before, so now I say again, if anyone preaches any other gospel to you than what you have received, let him be accursed” (Gal 1:6-9). These are the strongest of words penned by the apostle Paul through the inspiration of the Holy Spirit to the Galatian Christians. Twice Paul declares a terrible curse on those who pervert the real gospel of Jesus Christ. One of the great tragedies of the modern Western gospel has been the accentuation of the blessings and benefits of salvation at the exclusion of other components of the cross. There is a very large movement that is sweeping through many churches today that majors on life-enhancement, self-help, and self-esteem without hardly ever confronting sin and the works of the flesh. Sadly lacking from this sugar-coated gospel are heart-repentance, holiness, and the empowering grace of God to live in obedience to His demands. Prophet Jeremiah Johnson called this false gospel the gospel of accommodation. The preachers of this smooth, soft gospel may frequently speak of forgiveness, but rarely do we hear a clear and definitive call for surrender in true repentance. They may even speak of the blood of Christ to cleanse us from our sins, but rarely do we hear of the necessity of that same holy blood to appease the wrath of God against sinners. Frequently we may hear of how Jesus died to make us righteous, but rarely do we use God’s holy Law to strip the sinner of his self-righteousness. We may often hear of the need to gain the glories of heaven, but rarely of the need to shun the horrors of hell. At times we may hear of the resurrection of His power (although in many circles that is rare, too), but rarely do we hear of the fellowship of His sufferings. Frequently we hear of the good life we can have now, but rarely do we hear warnings of the judgment to come. And why don’t we hear more of the latter? Because we don’t want to offend anyone. The offense of the cross has been virtually removed from our gospel. The twentieth century has already passed, and things don’t seem to be improving at all in the twenty-first century. A new gospel has been produced from the ruling philosophy of the day that says, “If it works, it must be better. If our message adds to our number, if it comforts the people instead of offending them, if it makes them happy, if it keeps them coming to our meetings, and keeps them giving to our causes, then it must be good.” The results are what count. This dominating school of thought regards anyone successful as long as they get the job done and accomplish the goals; in this case, growing the church and adding to its membership. The proponents of this other gospel reason, “More people and more money equal success.” It doesn’t really matter how they accomplish their goals as long as they do. In this philosophy God becomes a means to an end; a useful God to help them attain the desired success. Others, to sound even more persuasive, may say, “More people means more salvations”, but are they really getting saved? 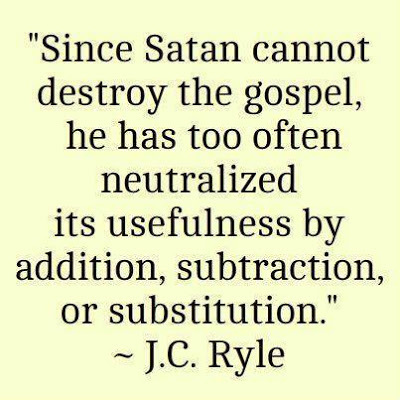 Or “More money means a greater propagation of the gospel”, but is it the real gospel? The rich man that went away sorrowfully after Jesus told him to sell his possessions and give the money to the poor (Mk. 10:17-22) would’ve still been with us today had he heard the modern gospel of goodness, acceptance, and prosperity. Many a popular preacher would’ve gone after him and negotiated a deal. Instead of a clear call to renounce his materialism, perhaps he could’ve been more easily convinced to just believe that Jesus was not merely a good teacher, but actually the Son of God. A simple little prayer would’ve got him in. Maybe this rich young man could’ve been persuaded to give a tithe of his possessions to the ministry instead of selling it all and giving the proceeds to the poor. That would’ve been much more reasonable and much less offensive to him, and that tithe would really help the church. After all, he had worked hard for his money. Or another popular method employed today would’ve been to make him an elder and offer him a position in the church and then perhaps his sorrow would be eased and his happiness would return. This is what we’ve done with the glorious gospel of our Lord. We’ve modified it; we’ve added to it and taken away from it; we’ve altered it, diluted it, and adapted it to fit the spirit of the age. Now we are reaping the rotten seeds of a very faulty sowing of the preaching of this false gospel in days gone by. This is greatly weakening the Church and putting her to sleep while helping to destroy a nation that is intent in rushing headlong into an antichrist abyss. It’s the perfect storm, one that we could stop if we would just shake ourselves from our lethargy and denial and wake up. It is time to make these crooked paths straight and prepare the way of the Lord.